In the keynote address at the Santa Marta Latin American conference in Buenos Aires on 9th February, Cardinal Vincent emphasised the centrality of upholding human dignity in the fight against human trafficking. Victims of human trafficking, he said, 'fall into the nothingness of dehumanising slavery, losing every shred of autonomy, every prospect or hope, enduring daily cruelty and the most demeaning of work. Yet the breath of God moves in them still and they long for the light. It is our determination to work for that to be restored to them. And to that end we must work together. He outlined several steps beginning with 'the person always remains at the centre of our action and awareness'. From this, the other steps follow: prevention and the pursuit of perpetrators, rescue and rehabilitation of victims, educating communities to open their eyes to the 'invisible reality of huma trafficking and modern slavery in their midst', and to work together to find resources needed to fight this evil. Part of the work of the Santa Marta project is to build trust among victims, law enforcement, governments and the Church. At the end of the Conference, the Cardinal called upon governments around the world to act on their commitment to assist victims of human trafficking: 'Most countries in the world have signed this protocol and ratified the measures to assist victims. However, they have turned their backs on this responsibility and are not acting upon this agreed commitment. In the UK a hostile environment towards migrants has been created and victims of trafficking have been criminalised, despite promises to support victims of this horrendous crime which sees so many kept in slavery. 'As the Santa Marta Group we will pursue this issue and continue to push for the victim to be at the centre of all we do. I have been inspired by the testimony of those working with victims in Argentina, and the leadership of Commissioner General Roncaglia head of the Argentinian federal police whose commitment to fighting human trafficking shows the way forward. The Latin American regional conference of the Santa Marta Group took place from 9th to 11th February in Buenos Aires. 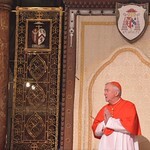 Cardinal Vincent is the president of the Santa Marta Group. He led a delegation from the UK to Buenos Aires for this latest conference.